A young, cultural scientist and researcher has comes home after studying abroad. At the recruitment agency he is met with some empathy and asked for his celebrity status “in the cultural circuits”. In the end, he is commissioned by the Icelandic Agricultural Association to write a script for a documentary concerning the Icelandic cow, which is in danger of extinction since Norway’s NRF cows are being imported to Iceland. Gradually, the ambitious cultural scientist has a revelation- respect for cows reflects the mentality of the people in all societies and cultures. Curiously enough, such correlations and ideas are not being received positively by the employers. After a creepy event in Hvalfjörður, theories of cows and men gradually take over the mentality of the young researcher. 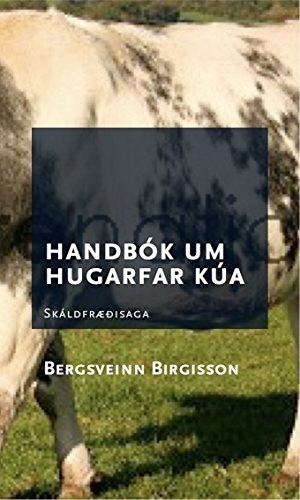 Handbook on mentality of cows is the second novel of Bergsveinn Birgisson and has become a cult book on the saga island.